DUSTSET 2020, can be pumped directly into the water supply line of your Crusher or Longwall without foaming of the mixture. The dosing pump can be setup to start and stop with water demand automating the application of the product. Will increase cutter and crusher spray effectiveness reducing airborne dust without increasing water spray rates. 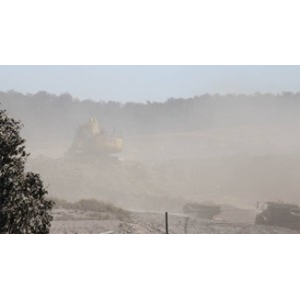 May not require any modification to your equipment and the application can be started and stopped to suit the level of dust control required. DUSTSET 2020 can be setup as a fixed irrigation systems allowing for hundreds of meters of roadways to be sprayed without the use of a water truck. The irrigation system can utilize pit water supply & a dosing pump or a pre-diluted pumping system. The pumping system can be setup to start and stop based on a pneumatic timer or set to shutoff after a fixed volume is pumped from a reservoir using a pneumatic float switch. When Dustset 2020 concentrate is applied consistently, firstly with loading dose and then maintenance dosing, improvement in not only dust control but also consolidation of the road surface will be shown with greater penetration the longer the continual use of product.